In addition, this story introduces three police detectives—Thode, Lusk, and O’Gar—who would reappear in later works. (O’Gar in particular would be a regularly recurring character—becoming almost a sidekick to the Op in future stories.) The detectives of Hammett’s early fiction reflected his firsthand experience at the Pinkerton Agency—and Pinkerton detectives worked closely with the police. 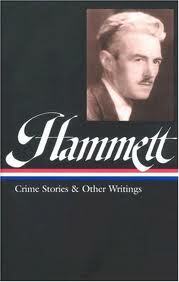 It would be several more years before Hammett developed his famous, self-employed private eyes whose relationships with corrupt or incompetent governmental authorities were often uneasy and contentious. Harvey Gatewood had issued orders that I was to be admitted as soon as I arrived, so it only took me a little less than fifteen minutes to thread my way past the doorkeepers, office boys, and secretaries who filled up most of the space between the Gatewood Lumber Corporation’s front door and the president’s private office. . . . If you don't see the full selection below, click here (PDF) or click here (Google Docs) to read it—free!